The Ashland County Historical Society is located in the heart of the Center Street Historical District of Ashland, Ohio. Its campus consists of three houses. The Manor House was the first purchased. It was built by J.P. Cowan in 1859 and sold to P.A. Myers in 1906 to be given to his son, Guy, and his new bride, Kate, as a wedding present. It was likely the first brick structure on the street. 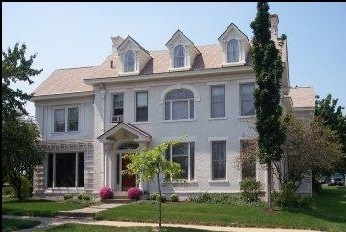 Guy and Kate resided in the home until the death of P.A. Myers. After that, several Myers relatives lived there. In 1952, the home was given to Ashland College to be used as a residence for the President. In 1969, the University used it as a Historical Center until the sale.